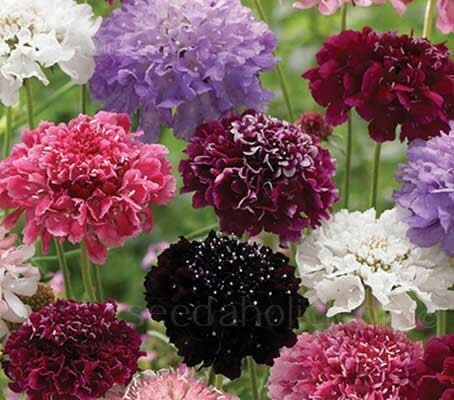 Scabiosa atropurpurea is one of the longest-flowering and most glamorous of flowers that you can grow from seed. The colours range from pure white through blues and violets to pinks to ruby reds, mauve and crimson. The flowers have the most delicious sweet perfume reminiscent of honey and marshmallows. A prodigious bloomer and a tough, hardy garden performer Scabiosa atropurpurea grows quickly and is fast to flower. Growing to 45 to 60cm (18 to 24in) tall, it blooms consistently throughout the growing season, from early summer and right through to late autumn. This clump-forming plant produces grey/green basal leaves before the stems produce pleasantly fragrant pincushion flowers when newly opened, As the flowers mature, tiny violet stamens emerge adding yet another beautiful detail. This invaluable plant will and attract many butterflies and bees to the garden and would look as happy in a wildflower meadow as in a manicured border. With fantastic long, straight stems that last more than a week in water supplying you with some excellent cut flowers. For weekly inclusions in the vase keep the flowers cut or remove the spent flowers to keep the delightful production of flowers growing throughout the season. Scabiosa atropurpurea is naturally a perennial species, but is only hardy to 0°C (0°F). It is native to the Mediterranean area and is a 'tender perennial' but is often rather optimistically referred to as a 'short-lived' perennial. It may sometimes survive a winter, particularly in mild climates, but it is generally used as you would any other annual. Simply put - in areas with cold winters the plants are easily grown as an annual, sown in spring they will be in flower by mid summer. You may be able to collect seeds from the flowers to plant the next spring, but once the first frosts of winter arrive the plants will die as they cannot survive in temperatures below 0°C (0°F). However, if you live in an area that enjoys frost-free winters the plants will die back once flowering has finished at the end of summer, but should return in spring the following year. You may, as a form of insurance wish to collect seeds from the flowers, just in case! Sow indoors in early spring three to four weeks before planting outside, alternatively, the seed can also be sown directly where they are to flower in mid to late spring. The plants usually take around 75 to 80 days from seeding to bloom. The seeds can also be sown September to October for early summer flowering next year. Sow in pots or trays of moist seed compost and cover with a very fine sprinkling of compost or vermiculite. Keep soil moderately moist during germination, which takes around 7 to 10 days at temperatures between 15 to 20°C (59 to 68°F). When large enough to handle, transplant the seedlings into small pots to grow on. Acclimatise to outdoor conditions for 10 to 15 days before planting out after all risk of frost 15cm (6in) apart. Prepare the ground well and rake to a fine tilth. If sowing more than one annual in the same bed, mark the sowing areas with a ring of sand and label. Sow 3mm (1/8in) deep in rows 30cm (12in) apart. Sow seed sparingly or they will choke out other seedlings. Water ground regularly, especially in dry periods. The seedlings will appear in rows approx 6 to 8 weeks after planting and can be easily told from nearby weed seedlings. Thin the seedlings out so they are finally 30cm (12in) apart. Carefully replant thinned plants. All scabious prefer well-drained soil and a sunny position. Only water in an extended drought and do not apply large doses of fertiliser as flowering will be suppressed. Deadhead to prolong flowering and encourage new flower buds. At the season's end, don't be too quick to pull up withering plants. Birds love to snack on their seedheads in autumn, and the seeds that they miss may drop to the ground and reward you the next year by sprouting into a whole new crop. Scabiosa is a cut-and-come-again bloomer, meaning that the sooner you cut the blooms, the quicker new buds will pop up to replace them. The blooms appear so profusely that you'll still have plenty of colour in the garden after you've picked your flowers. Cut flower stems can be harvested, when the flower show colour. Put the stems in warm water immediately. Vase life: 8 to 10 days. Cottage/Informal Garden, Flower Arranging, Borders and Beds. Butterflies and Bees. Scabiosa is a genus of about 80 species that are native to Eurasia and Africa. Scabiosa atropurpurea was the first scabious to be introduced into cultivation in 1591. 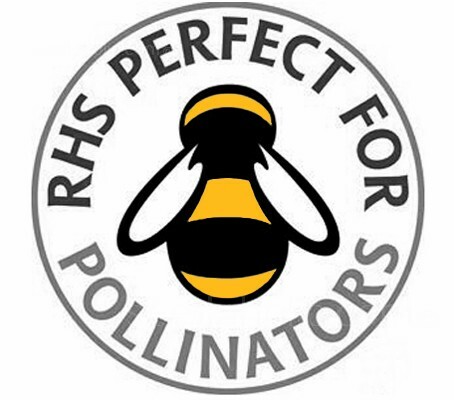 Since then several species have been introduces and many cultivars are now available as popular garden ornamentals. Scabiosa atropurpurea is native to the Mediterranean area, southern Europe, western Asia and Northern Africa. It is widely grown as an annual in temperate regions and a perennial in the subtropics and tropics. S. caucasica and S. columbaria are hardy and are grown as perennials in temperate climates. Pronounced skay-bee-OH-suh at-roe-per-POOR-ree-uh, Scabiosa atropurpurea has the common name of ‘Sweet scabious’ due to its sweet honey-like fragrance. The common name of 'Pincushion flower’ derives from the fact that its long, needle-like pistils resemble pins sticking into a pincushion. Well-drained. Does best in slightly alkaline soils. or April to August for flowering the following year.